The Pima/Maricopa Villages (now the Gila River Indian Community) is spread about 60 miles along the Gila River from Sacaton to the mouth of the Salt River. They were agriculture-based and were very friendly and helpful to American travelers, who often arrived without water or food after a long trek across the desert from Tucson. The Pima villagers (now Akimel O’odham) occupied the eastern two thirds of the distance and the Maricopa (Piipaash) lived in the west. At the time of the original survey of the Pima Indian Reservation by A. B. Gray in 1859, the tribal chief lived near a low hill in modern Bapchule/Casa Blanca. This is just west of Interstate 10 near the old Pima Indian Visitor’s Center and is generally considered to be the center of the Pima Villages. A popular campsite was Maricopa Wells, about 4 miles west-northwest of Pima Butte. It was located near the dry channel of the Santa Cruz River and water was fairly dependably obtained there in several dug wells. This was also the last availability of water and forage for those crossing the 40-mile jornada to Gila Bend. While Bartlett’s men were camped at the Pima Villages they surveyed the surrounding area, moving their camp occasionally to be near the work areas. The picture below shows Pima Butte in the middle distance at right with the Santa Cruz River/Vekol Wash in front of it and the Gila River beyond it. Maricopa Wells is probably located near the trees shown near the wash at left center. This scene was also sketched by Bartlett. The viewpoint is from a hillside at the south end of the Sierra Estrella Mountains. 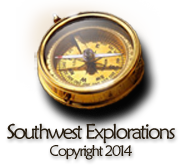 My thanks to Jerry Mueller for information he provided about this location. 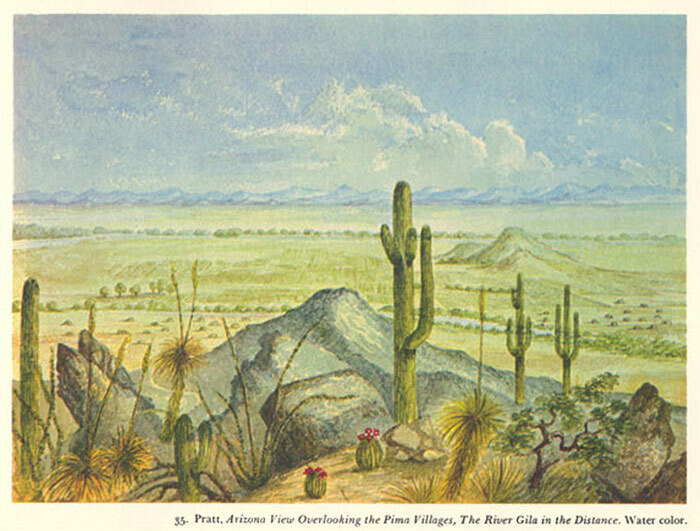 Henry C. Pratt’s 1852 watercolor of the Gila River valley overlooking the Pima Villages. From Bartlett’s West by Robert V. Hine. Used by permission.